Armando, formerly known as AC, is an SSB4 Meta Knight main with a strong Falco secondary in from San Diego, California, and is considered the best active Meta Knight and Falco player in the world. 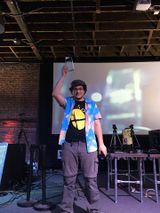 Armando was ranked 13th on the SoCal All-Time Smash 4 Power Rankings and 47th on the Panda Global Rankings 100. He has taken sets off of top players such as MkLeo, KEN, VoiD, Cosmos, WaDi, Samsora, Mr.E, Raito, NAKAT, falln, and 6WX. On January 1st, 2018, he was signed by Breakout! Esports. ↑ Breakout! Esports signs Armando. This page was last edited on April 14, 2019, at 16:04.